Receive live enquiries catered to your niche from customers who are actively seeking products and services like yours. Grow your wedding business stream and easily manage leads and in-app bookings with our growing list of features. Build brand recognition via reviews and awards to establish yourself as an industry leader that customers know they can trusts. Growing any business can be a challenge but for those operating in the wedding sector, MyShaadi brings you more opportunities to reach potential leads. Our unique and dedicated portal is exactly what you need to expand your wedding business. We give you a simple, effective way to extend your reach to a new audience. Couples and wedding planners use the MyShaadi app to source suppliers, look for special offers on wedding services, or discover something new and unique to add the wow factor to their special day. 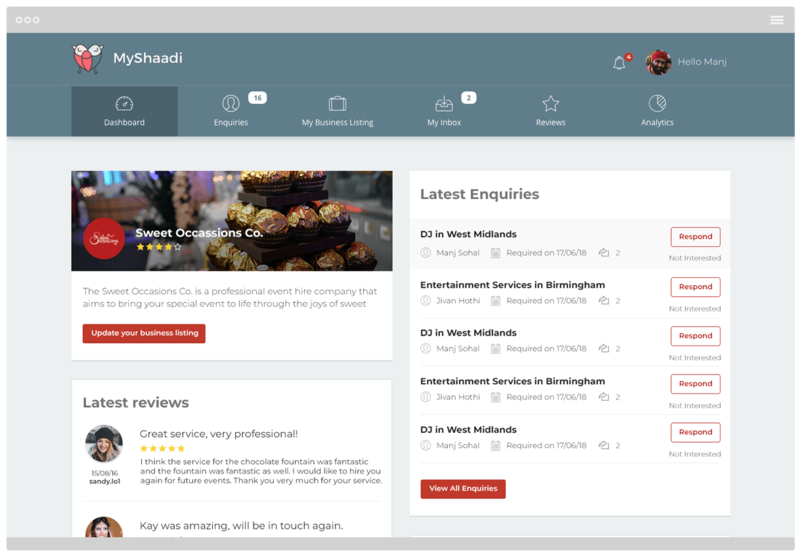 Unlike other directories, the MyShaadi app has been designed with both customers and suppliers in mind to create a streamlined, simple to navigate tool. Accessing the database that MyShaadi connects you to, can help your business reach new heights and achievements. List exclusive promotions and deals to generate enquires and interest in your business. Request and gather reviews from satisfied customers to further enhance your profile. Have a single platform for communicating with all your leads and customers. Earn badges and rewards to build trust whilst demonstrating key attributes. 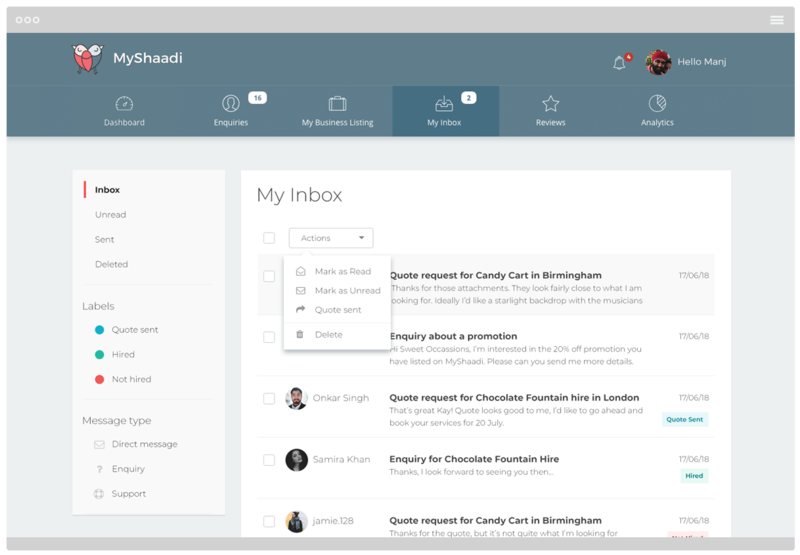 Become a supplier with MyShaadi and benefit from increased business leads and sales.